My name is Chris Hooper. My family and I live in Austin, Texas. 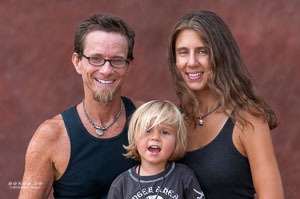 Chris “AoxoA” Hooper with lovely wife and son. AoxoA was created for you to see my digital art, images, and photography. In the blog, you’ll discover articles about music, photography, technology, handpan, cultural history and travel. AoxoA is a palindrome whose meaning may be interpreted the same way in either forward or reverse direction. The word is pronounced by saying each letter individually as you would when reciting the alphabet—a, o, x, o, a. After a few attempts it will roll off your tongue sounding like some new language. As you can see from the images, my style varies from capturing genuine organic natural images to creating images that are digitally processed to create special effects and designs. I accept personal, editorial, commercial and event photography assignments in a variety of genres. I am an Adobe Certified Associate in Photoshop. I provide custom retouching and post processing for almost every type of photographic work. Turn your ordinary photos to extraordinary works of art. Posters, flyers and social media banners for your events.